Get fresh, brighter skin with Qraa's Activated Charcoal Scrub specially formulated for Men. This detoxifying charcoal scrub delivers a deep-pore clean. Its natural charcoal draws out the dirt and excess oil that can clog pores. It gives a soothing, non-drying lather and gently washes away impurities. This face scrub is the weapon for dead cells and hard skin. 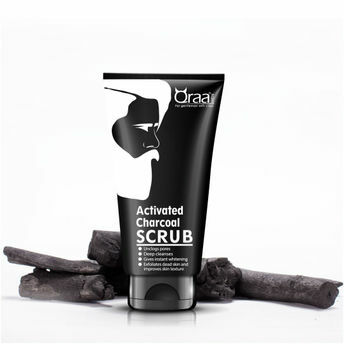 Polish your skin with the best charcoal scrub, it provides deeply cleaned, tingly-smooth skin!